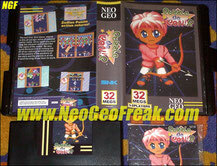 This time, I finally came to awareness: Visco is undeniably my favorite editor on Neo Geo, just like MadMax. The home policy is simple: why bother when you can let others rack their brains and then take their work? 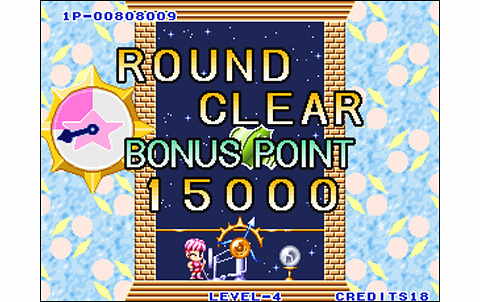 Well, it is exactly in this line of conduct that came out (still licensed by Taito, hum) Puzzle de Pon! 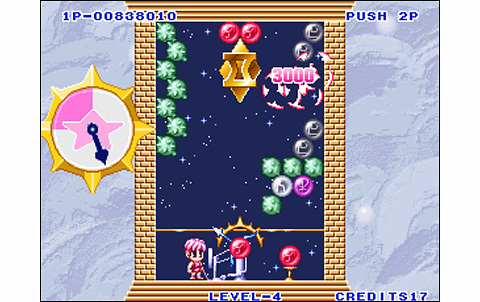 in 1995, and Puzzle de Pon! R in 1997. Both titles plagiarize shamelessly Puzzle Bobble, and obviously one can not help but imagine a parallel with Breakers, which was plagiarizing Street Fighter II. Oh, no big news in the "R" version, which is a simple update for the arcades, packing very few changes. 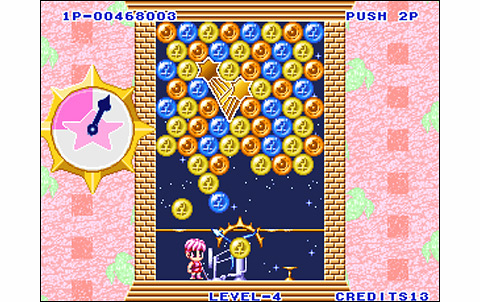 The editor, however, added his two cents to his "Puzzle Bobble-de Pon" and "Puzzle Bobble-de Pon-R", as we shall discover in this following lines. 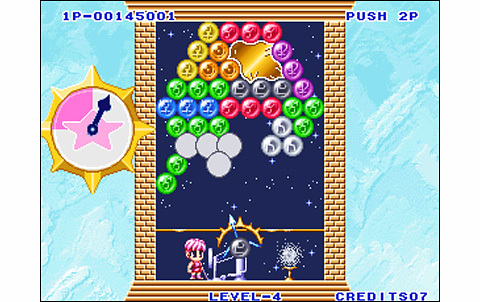 Astrology is a theme of choice to the japanese people, and Puzzle de Pon! R is one more example of this fact. Indeed, the adventure is about to retrieve the twelve zodiac talismans as well as the sun's one, trapped in hundreds of color spheres you'll have to explode. No less than thirty-nine levels await you in a challenging single player mode: that's not too bad! 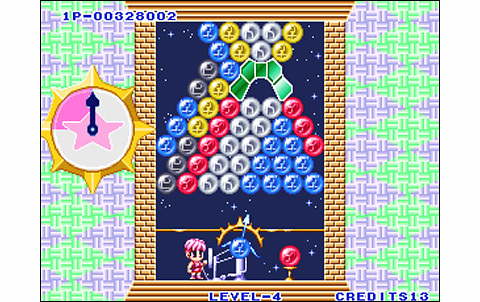 The idea of Puzzle Bobble is taken back at 100%: player have to coagulate at least three balls of the same color to make them explode. 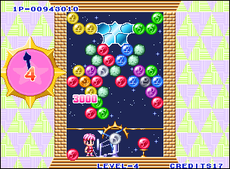 In the Taito game, the goal was to completely 'clean' balls on the screens to move on next stage. Here you have to 'free' the precious fetishes held by balloons. Aries, Taurus, Gemini ... Every three stages, you'll have the opportunity to get an astrological sign, and you'll have to recover the twelve zodiac signs to access the stages where you can get the sun. The versus mode works the same way: the first player who releases the talisman wins. But it's also possible to win by causing the adversary to 'line out' (the balls come below the line at the bottom of the screen), by stuffing his screen with a maximum of balloons by playing better than him. And you know what? 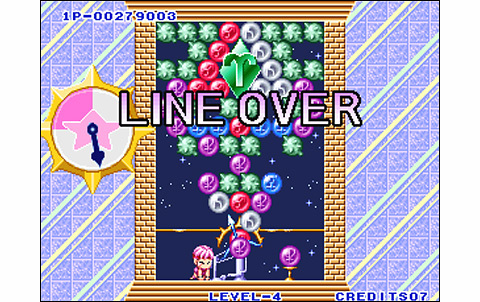 This fun gameplay principle also comes from Taito's Puzzle Bobble, how original! 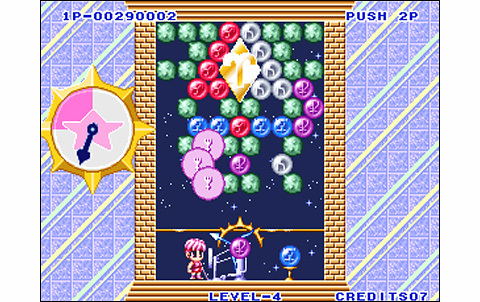 Alas, despite this promising pedigree, matches between players in Puzzle de Pon! R are ultimately less addictive than in its model: this is probably due to the timing of the game a bit different and less prone to surprises. Here the ceiling does not descend, but the time is limited to ninety seconds per level. You won't be allowed to loose your time, as some levels are practically impossible within the regulatory time. Fortunately, Visco added some interesting extra items, which are generated randomly during the game. First, there's the Arrow, which shows a directional line which allows you to anticipate the trajectories of the balls you launch; then there's the Bomb (B), which will destroy all the balls it will touch; and finally, the Star can literally disintegrate all spheres of the same color. Use these bonuses wisely, as these might sometimes save the day! 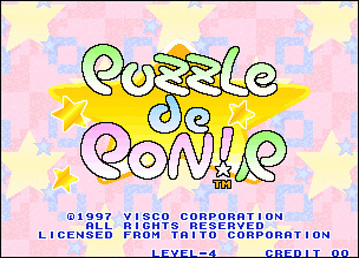 Puzzle de Pon! R is undoubtedly fun, no matter you're playing alone or with a friend, but despite all the efforts ade by Visco, the soft is still less addictive than Taito's famous Puzzle Bobble. That's undeniable: controls has neither the accuracy nor the intuitive aspect felt in this mega-hit. Two-players matches are not as fun, and the gameplay seems less fluid too. However, the realization is quite decent, with a soundtrack composed of themes, voices and sounds nice and varied, and cute backgrounds that change quite often but are confined to a childish and simplistic register. 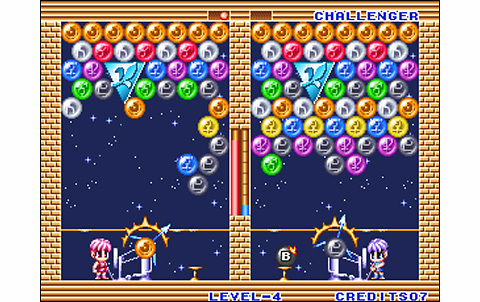 Once again, Visco simply copies an excellent soft without adding anything interesting: this Puzzle Game on the Neo Geo is definitely a good game, but it owes its salvation to the basics of gameplay borrowed to a legendary title, made by another publisher. The backgrounds are quite varied, despite a certain linearity and little graphic research! Animation of the game is a little stiff and less decomposed than in PB. Anyway the whole thing is on Par. The soundtrack is of great quality, with nice themes and successful effects, but few. There's thirty-nine stages to clear in order to get the twelve zodiac signs and the sun, and be aware that the difficulty is high! 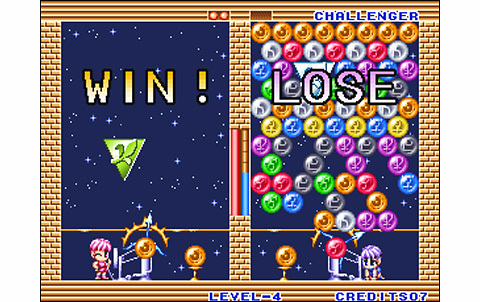 Versus mode is less taking and fun than in Puzzle Bobble, but it's still worth it. 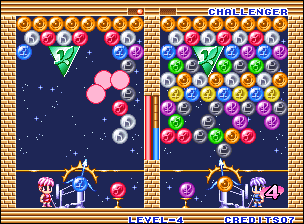 Nothing new here, principles of Puzzle Bobble are kept and declined around the symbols you have to free in each stage. 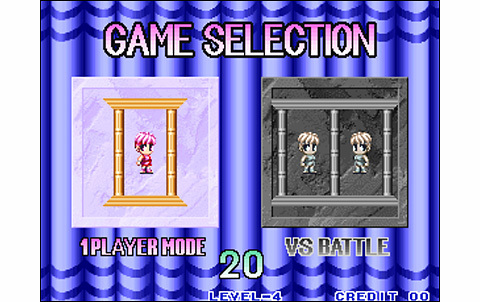 It's less fluid and playable than in Taito's game, despite some good ideas like the scoring systems or the special items. 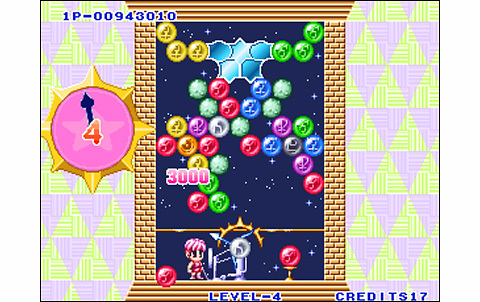 Another Puzzle Bobble clone which simply makes the bare minimum, but hey, with Visco, we're getting used to it. 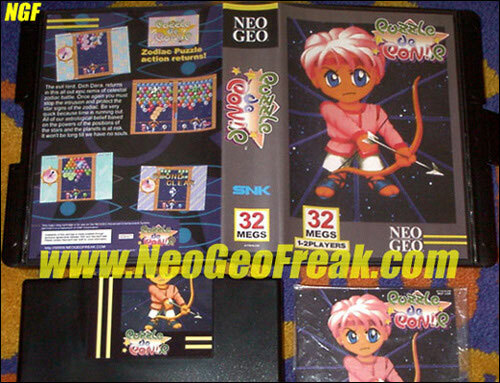 Unless you want to possess every puzzle game released on the Neo Geo or you're a big fan of the genre, I really don't see why anyone would put 150 euros in this title, whereas Puzzle Bobble offers better for the same price.